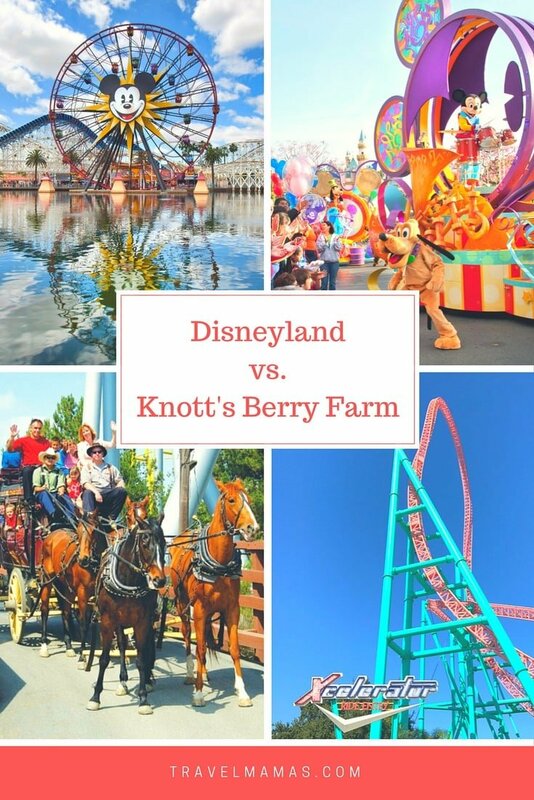 Disneyland vs Knotts Berry Farm: Which Is Best for Your Family? Disneyland vs Knott’s Berry Farm? With so much to do in Southern California, travelers need to choose wisely when planning their vacation days. Here’s a look at the differences between these two theme parks so you can choose the best one for your brood. 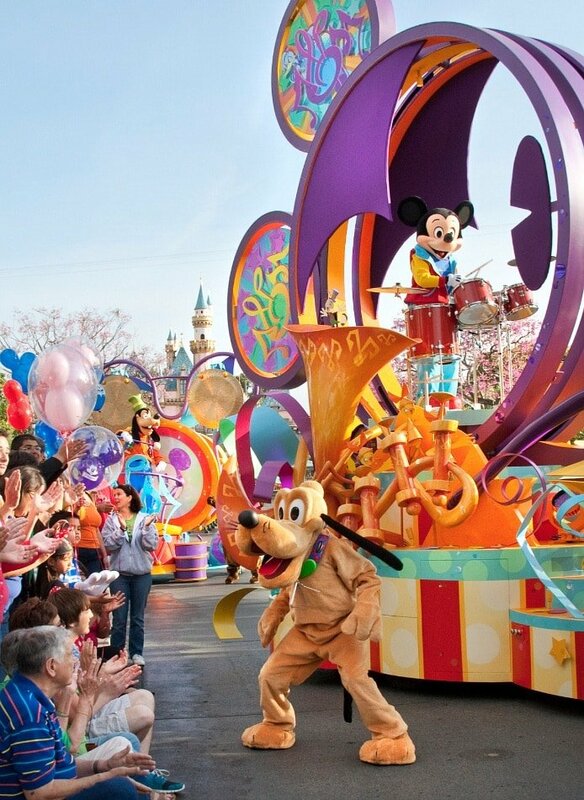 Find Disneyland Resort deals including ticket discounts and discounted hotel packages! Save up to $22 per ticket when you buy discount Knott’s Berry Farm tickets here. Both Disneyland and Knott’s Berry Farm offer an abundance of rides suited to all levels. 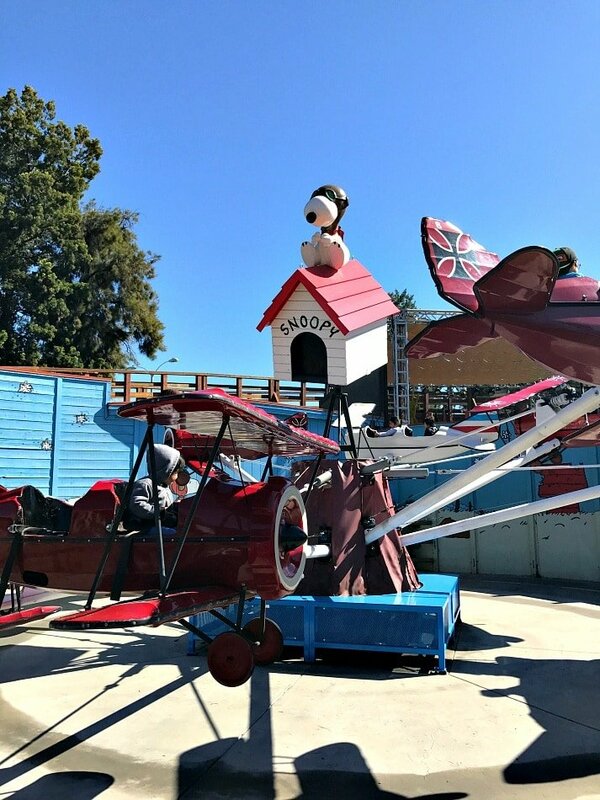 Camp Snoopy at Knott’s Berry Farm boasts 14 rides for wee ones, like Charlie Brown’s Kite Flyer swings, Timberline Twister kiddie coaster, and Flying Ace airplanes. Teens, like my daughter, may not get all that excited about seeing Mickey Mouse or getting their photo taken with Snow White. But Disney California Adventure Park does offer California Screamin’, which tops out at a zippy 55 miles per hour. The Twilight Zone Tower of Terror was always sure to elicit screams and has remained just as thrilling for park goers now that it has re-opened as Guardians of the Galaxy. The roller coasters at Disneyland proper are more about theming than sheer speed, but Space Mountain, the Matterhorn Bobsleds, and Big Thunder Mountain Railroad remain hits. If thrills are what you’re after, be sure to read our picks for the scariest rides at Disneyland. Whereas Disney’s focus is on themed attractions and characters, Knott’s Berry Farm is more about carnival rides and games. The theme park does offer live entertainment, mostly starring Peanuts characters (Snoopy and friends) and Old West characters. The big hit for adventure seekers, though, are the plentiful thrill rides at Knott’s Berry Farm. 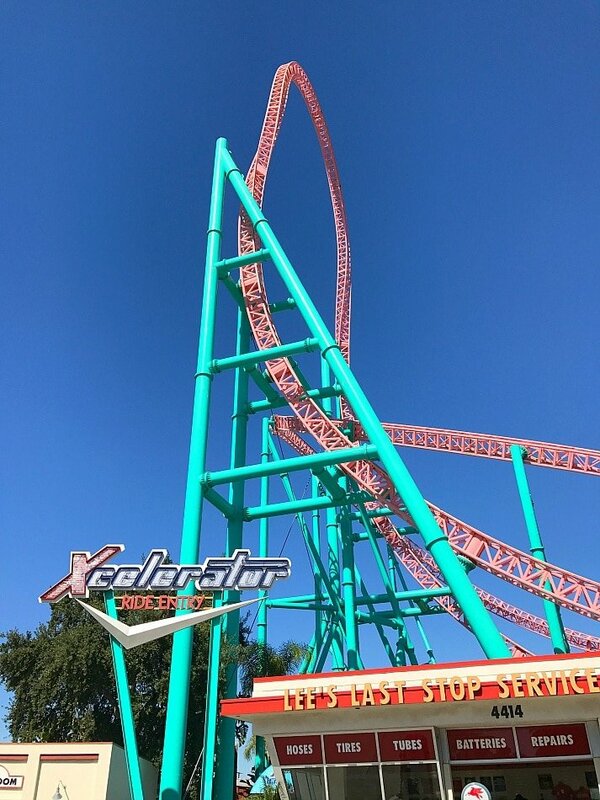 There are nine coasters in total, including Xcelerator, which reaches a rip-roaring 82 miles per hour! When comparing Disneyland vs Knott’s Berry Farm, both parks offer the usual carnie type food. There are several differences, however, that set the parks apart. Knott’s, being a smaller park, offers simple fare once you’re in the gates. The offerings are predictable, but the carne asada is worth the calories (found in Fiesta Village). It features fries topped with shredded beef, sour cream and guacamole. For sweets, consider the churro or funnel cake sundae or a boysenberry soft serve cone. The best dining option at Knott’s, however, is found outside the park gates in the California Marketplace at Mrs. Knott’s Chicken Dinner Restaurant. Here you can tuck into their famous full chicken dinner. 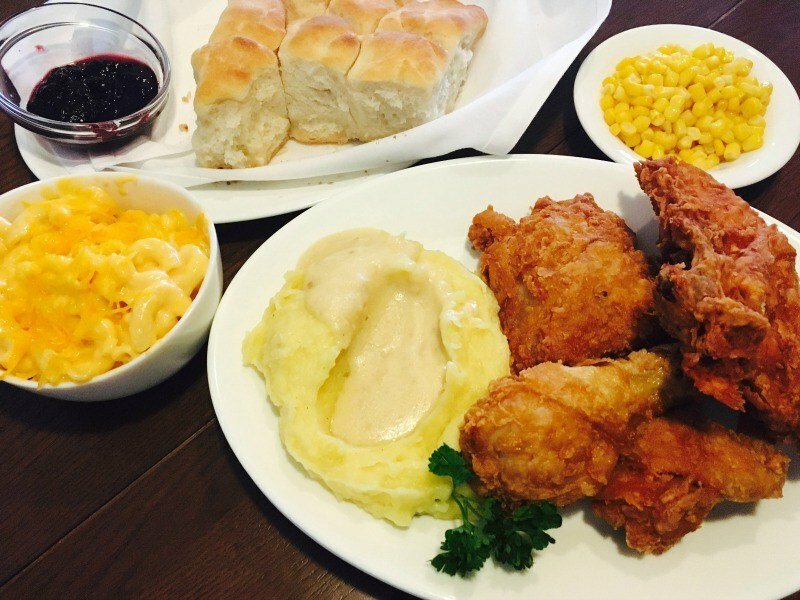 It’s comprised of four pieces of fried chicken, mashed potatoes, salad, hot biscuits and jam, plus pie! You also get a choice of either chicken noodle soup or stewed cherry rhubarb, plus cabbage or corn. Our family of three split this entree and had enough leftovers to take home! Read reviews and make reservations at Mrs. Knott’s Chicken Dinner Restaurant now. 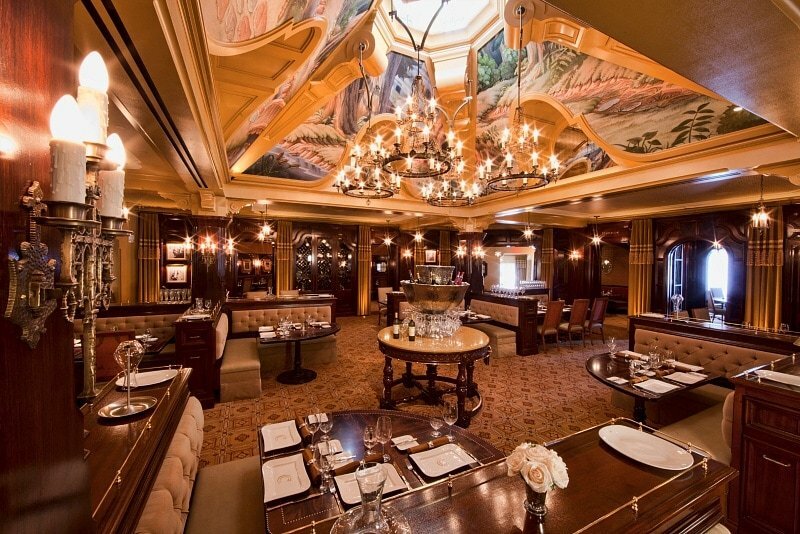 It’s a good idea to book any sit-down Disney meals in advance. Reservations are accepted up to 90 days in advance. Book your character meal now and save up to $11 per adult meal and up to $5 per child meal. It’s tough to compare apples to oranges, or Mickey to Snoopy, as the case may be. My family recently visited Knott’s Berry Farm on a sunny weekend and I wouldn’t describe it as crowded. Then we hit Disneyland on a rainy weekday and it was packed. To do Disney properly, you need to budget at least three days. (We only had one). Meanwhile Knott’s Berry Farm can be fully experienced in a day. 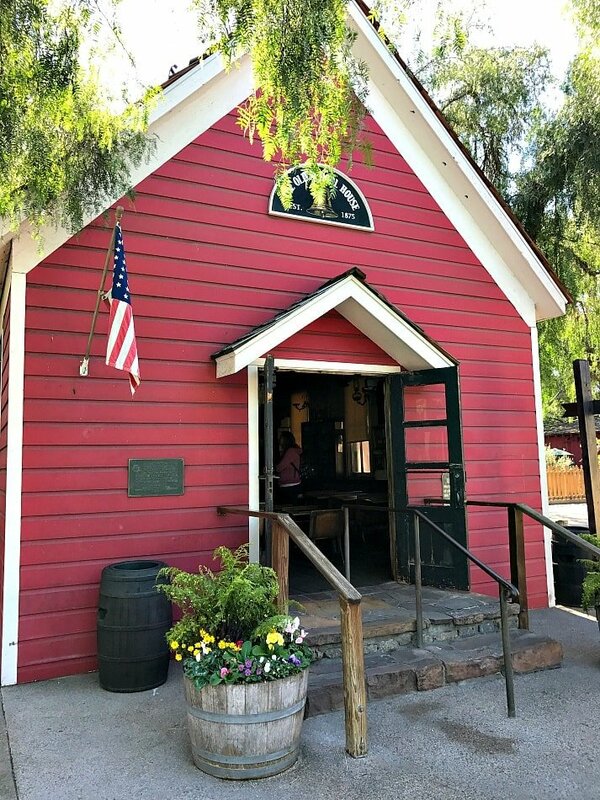 Knott’s Berry Farm is a lovely theme park with a fun historical village called “Ghost Town” that features old time shops, artisans making crafts, and a real one-room school house. Knott’s is more affordably priced than Disney and if rides are what you’re after, you’ll find plenty of them at all thrill levels. Disneyland takes it up a notch with their daily parades, nightly fireworks, princess makeovers and an arsenal of characters roaming through the parks to interact with guests. Plus, Disney’s live entertainment is top notch. California Adventure’s Frozen Live at the Hyperion will impress even the most critical Broadway theatre fans. I had such fond memories of visiting Knott’s Berry Farm amusement park as a child that I wanted to recreate the experience for my daughter. For our family, it was well worth visiting both. It’s not that one is any better than the other. They’re each special in their own way and worthy of a visit when touring SoCal. Save up to $22 per ticket when you buy discount Knott’s Berry Farm tickets here. A Note from The Saucy Travel Mama: Thank you to Visit Anaheim and Visit California for hosting my trip. As always, my opinions are my own. I agree. It would be hard to go to CA and not go to Disney. We’ve never been to Knott’s Berry Farm, but we’ve been talking about it. This couldn’t have come at a better time for us. We’ve been weighing the pros and cons of trying a new park. Thanks! Great! Hope you enjoy both parks! We’ve passed over Knott’s Berry Farms in favor of Disney before, but only because we really had no idea what it had to offer. Thanks so much for giving us a post with all the goods on both! Thanks for taking the time to comment. Hope you have the time to make it to both on your next visit. Knott’s Berry has always been a place I’ve wanted to go see. It’s nice to see the inside look of it you’ve given here. Thanks, Rosey. I hope you make it! I went to both places when I was very young and haven’t been back. I look forward to going again and bringing my grandchildren! There are so many fun theme parks in California! You’re so lucky to have gotten a chance to experience them all! I have been to Disneyland but not Knott’s Berry Farm. I think my boys would enjoy both, but probably Disneyland a bit more since their favorite characters “live” there! Well if you can swing it, it’s worth visiting both. I was surprised how much my daughter loved Knotts. I think it was her favourite. I think Knott’s Berry Farm would suit our family best. We have some serious thrill-seekers in the family. It was less crowded, too. Thanks for taking the time to comment, Melissa. I hope you get there one day. This is a super helpful comparison. I wouldn’t mind checking out both parks at some point. I’ve been meaning to check out some of the Disneyland rides though. This is a really helpful post for planning a vacation for the family. I think both parks offer unique experiences and if the finances would permit, I would visit both if I get to SoCal. 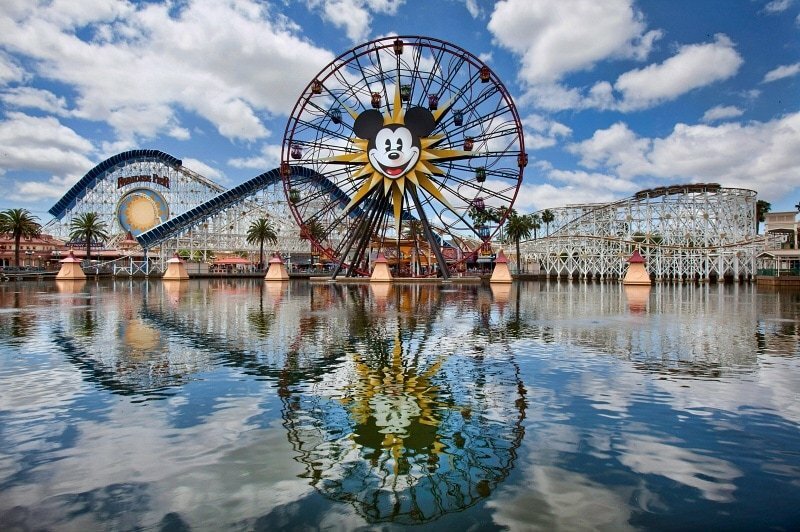 Why not maximize the time you are there and visit both Knotts Berry Farm and Disneyland! That would be awesome! I come from a family of big Disney fans. My Mom has been to both Disneyland and Knott’s Berry Farm. I haven’t, so ideally I’d like to check out both. I have always loved Disney and it’s a huge part of our lives. I would definitely not miss it for the world but it’s nice to go to other attractions as well. If you know what you like nothing wrong with sticking to it. 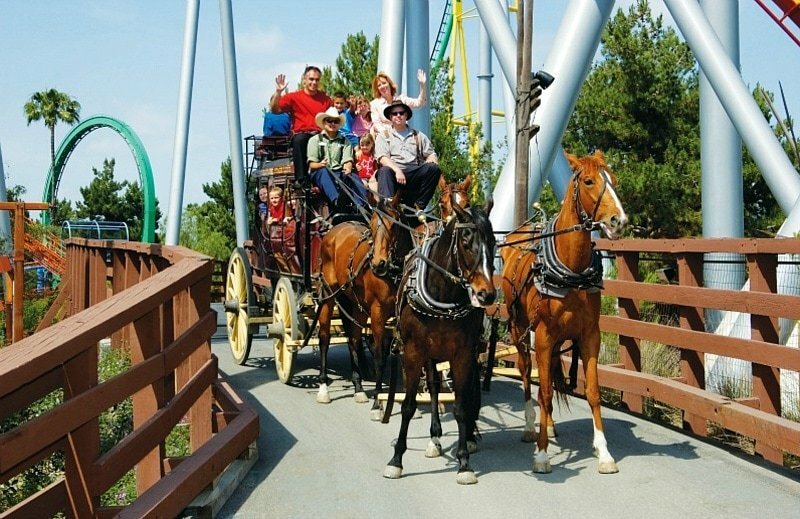 I have never heard of Knott’s Berry Farm but it sounds like a great place for the family! It seems like it would be hard to decide who was best because they both sound awesome! So interesting you’ve never heard of Knotts Berry Farm. I wonder if they pulled back their marketing to certain states? We’ve never been to either which is ok with me. Having so many kids the thought of these places while so much fun gives me such anxiety. Maybe when they are older it would be tons of fun! It can be tough travelling with kids especially with so many busy attractions. Colleen (Chief Travel Mama) wrote The Travel Mamas Guide, which you may want to check out. It’s got some really good tips on how to manage it all. We are headed to Cali next week, so this is areat info! Hope we will make it to Disney while we are there! Thank you for this our Daughters High school seniors are planning a trip in may 2018. They choose this because they don’t want the kids overnight in hotels (only on bus) so they can drive all day night, start early do all day get back on bus and head back. Coming from a small town in middle of nowhere USA it will still be a thrill for them! Nice write up on contrast between the two! Oh wow, Tina! Are they doing both parks in one day?! That will be a busy and fun day for the kids. I remember a similar trip to Disneyland from Arizona on a bus during middle school and had and incredible time! At least 1/3rd the price and crowds, the locals know Knotts is by far a better entertainment value for your dollar than Disneyland. Great to get a SoCal resident’s perspective on the two theme parks. Thanks for weighing in! My kids are older. This is their first Disney experience. (Disneyland) Does anyone know what we should not miss there? Hi Karen – How exciting that your kids will get to experience Disneyland for the first time! 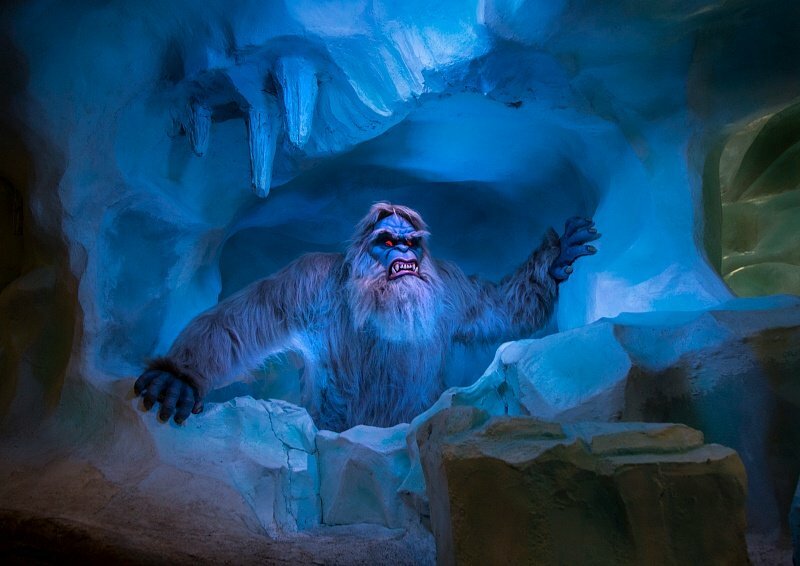 Since they are older, I suggest checking out our list of the Scariest Rides at Disneyland: https://travelmamas.com/scariest-rides-at-disneyland-kids/ (whether they want to ride ’em or avoid ’em!). 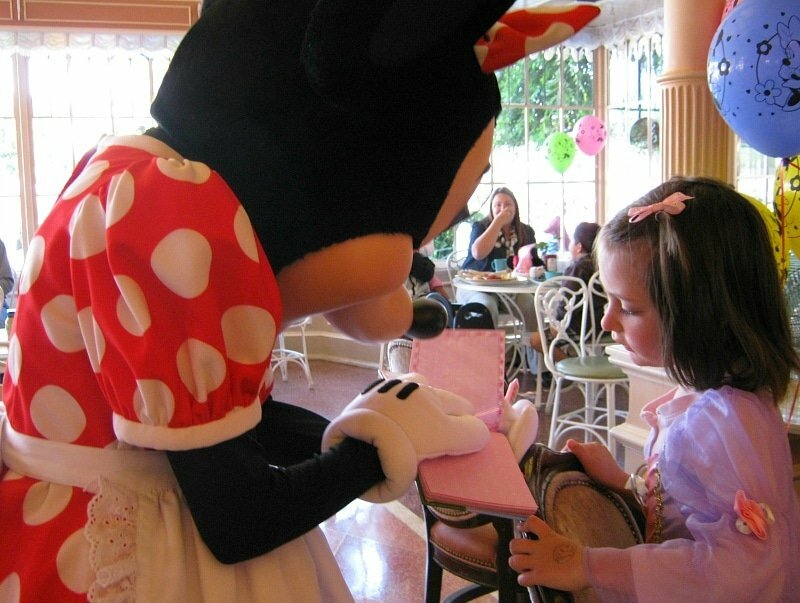 Even big kids enjoy character meals, so be sure to take a look at our round-up of every character meal at Disneyland to help you choose which one to book: https://travelmamas.com/which-disneyland-character-meal-is-best-for-your-family/ I hope that helps! Have WONDERFUL time at Disneyland! My love for Snoopy and the Peanuts Gang is eternal, I took my family there a few years ago and it was awesome. Loved having a Snoopy themed room and having Snoopy tuck the kids in every night. Disney is cool, but Snoopy and Knots are the best. How wonderful to get to share your love of Snoopy & the Peanuts Gang at Knott’s Berry Farm with your kids! Home » THEME PARKS » Disneyland vs Knott’s Berry Farm ~ Which Is Best for Your Family?